for 2008 by the National Garden Bureau. drained soil of minimal fertility, as too much fertilizer can make plants flop. These flowers are attractive to bees and butterflies, the seeds to birds. summer until fall are on plants two to three feet high. One of the oldest grown cultivars is of the perennial cutleaf coneflower (R.
dainty one to two inch wide gold flowers on plants two to five feet tall. perennial. It fills in among other plants, or is good in masses. plantings. 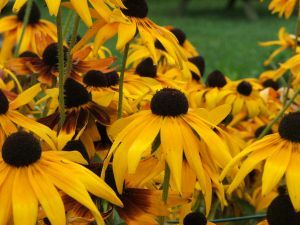 Try the perennial rudbeckias in meadow or prairie-style gardens. as Russian sage, catmint, blue lobelia and fall asters.